Ceremony Area Facilities: Private Bridal Preparation room with private bathroom, Ceremony on the highest point of the property, Reception & Cocktail, 1 Outdoor Bar, 200 sqm Swimming Pool, infinite Jacuzzi overlooking the Caldera, Parking area, Guests’ bathroom facilities. You can choose from a variety of menus that are recommended. Live unforgettable moments on your special day. Breath taking sceneries, the world’s most stunning sunset, glary black sand beaches or traditional Santorinian wineries. All at your disposal, with our full wedding planning services. 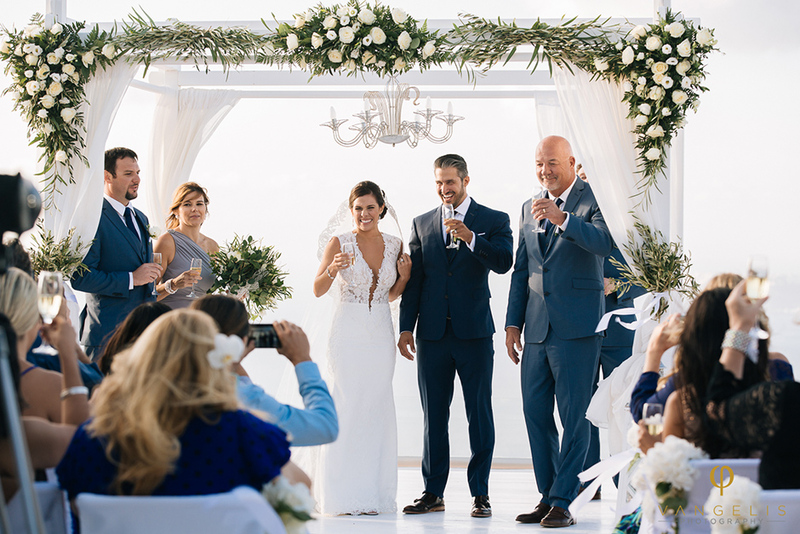 Choose from a wide variety of packages which include from wedding proposals arrangements to coordination of all types of weddings, from small and intimate to large scale events. A 5000sqm estate with a unique privileged location, one of the highest points in Santorini offering magnificent views of the Caldera and the famous Volcano. A 400sqm villa surrounded by beautiful manicured gardens, elegant pergolas extended from the sides of the villa and connected to the main front area of the property where different levels create the outdoor focal point with dining and relaxing areas, outdoor bar, barbeque, a 25 meter pool and a heated infinite Jacuzzi pool all overlooking the Caldera and the Volcano. Santorini is an excellent choice for organizing a conference venue and business meetings. Travelling to Santorini is easy and the Mediterranean weather is perfect for all travelers. We provide all the facilities and amenities to host any major convention. Technical equipment, Conference halls, meeting rooms, and distinguished planning services. We organize weddings, events and destination arrangements, providing accommodation solutions, food and beverage and catering.